Managing business expenses manually has to be one of the most ineﬃcient, costly and let’s face it, dreary administrative tasks that your staﬀ have to undertake. From the drudgery of ﬁlling out claim forms to chasing supplier invoices, to the time spent by your accounting staﬀ keying in data, the diﬃculty with enforcing company policy and at best, a hazy picture of where your company’s dollars are going. You can do it this way, but do you really want to? Here’s a Before and After of expense management that will make you say ‘goodbye’ to managing your expenses the old-fashioned way and ‘hello’ to taking the whole process online. Small, growing and large companies. 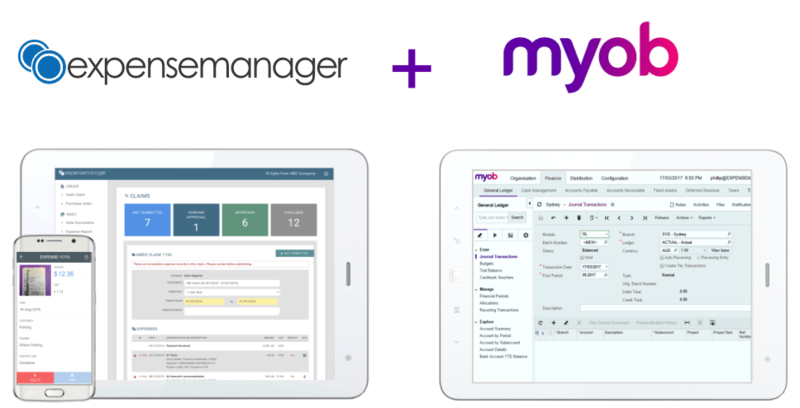 Approved data in expensemanager is sent to MYOB. No more manually entering expense claim and invoice information or clunky exporting, it flows through to your accounting software. Intelligent, ERP and Payroll software with sophisticated tools that growing businesses need today, to grow tomorrow. Interested in one of our Add-on products?